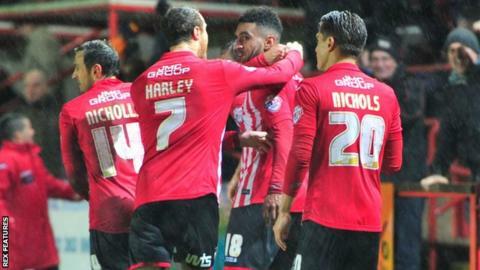 Exeter City manager Paul Tisdale says the club's fans played a big part in their 1-1 draw with Bristol Rovers. Jamie Reid scored a stoppage-time equaliser to extend City's unbeaten run to five matches in all competitions. "The Big Bank was the best I've seen in a long time, if I had to give man of the match today it would be to the Big Bank," Tisdale said of the home end. "The players put an enormous amount of effort in, but it was pushed and encouraged and lifted by the Big Bank. He continued: "When you consider how many shots were raining in on our goal, they were absolutely brilliant." Tisdale said both sides deserved praise for their efforts in a "terrific" game. "Bristol Rovers were absolutely brilliant, as was the effort of my players, I was so proud of them, regardless of the last-minute equaliser, " he told BBC Radio Devon. "It's not every day that it goes your way, you're not entitled to have it your way all the time. "My players did the tough stuff really well and that's why I'm proud of them. "You don't always get an easy win, sometimes you have to go and make it a performance. We didn't have a great deal to cheer about in the first half, but I'm really pleased with the way we applied ourselves."